Transport wine without losing its cool. This 3-bottle neoprene wine tote bag is a stylish solution to Bring-Your-Own, in a fashionable black messenger bag style with The Wine Enthusiast logo silk screened in white. Nearly weightless, the neoprene 3 bottle wine tote uses the same material for wet suits to insulate your wine bottles at cellar or fridge temperatures without clinking or shattering. Also available as 2-bottle neoprene wine tote. NOTE: Neoprene wine totes can not be used with wine bottles as carry-on luggage on any domestic or international airline flights. For FAA approved wine travel luggage, please see our collection of TSA-Approved Wine Carriers. Does it collapse small enough to pack in a suitcase without wine in it? BEST ANSWER: Yes, it will easily fit into a suitcase. it will collapse flat on its side or can be folded in half or rolled up (I'd probably remove the freezer packs before rolling it up, though. You can pack those flat.). Since it is all soft neoprene, there are no rigid pieces. Yes , it will collapse small enough to pack. To store mine I stuff it into a wooden two bottle wine carrier. Yes, it is made out of a very flexible material. Will definitely fit in small suitcase. Yes, it will pack relatively flat. Yes. Folds flat about 1-1/2"
will 1.5 liter bottles fit in this carrier? BEST ANSWER: The Neoprene Wine Tote Bag is specifically designed to accommodate standard wine bottles which are 12 to 13 inches in height and a 1.5 liter bottle is usually 14 inches high. You probably can fit 2 larger bottles in the 3 bottle bottle by just adjusting how the bottles sit. Hi Bob: i don’t think so. It is perfect for 3 regular sized bottles. The neoprene is lightweight and the strap keeps the wine secure on your shoulder. Great carrier for regular sized bottles. Yes, the inner dividers are attached by Velcro, so they can be removed or adjusted. I love this bag! I do not think it will zip up with a 1.5L wine bottle. Is it possible to carry a bottle of wine in the middle and wine glasses in the side pockets? not little wine glasses, nice cabernet glasses. BEST ANSWER: The bag is very unstructured so I would think anything but really heavy glasses would be highly likely to break. And really heavy wine glasses probably aren't what you're thinking of. It's a great bag for bottles though. Yes, glassware can be placed inside the Wine Tote but we would highly recommend additional padding to ensure the safety of the glasses. Yes it's possible. I would had a little padding around the glasses to prevent the bottle and glasses from banging into each other. Has anyone found a nice good quality 2-bottle carrier with a space for two nice wine glasses? BEST ANSWER: The Neoprene Wine Tote Bag 3 bottle bag might be a good choice for you. You could store the wine glasses in the middle wine bottle slot. I would wrap them before storing them in the slot. Maybe even try the weekend wine bag, item number 951 22. We bought the neoprene wine tote bag that holds three bottles of wine. But we usually carry two bottles and use the third space for stemless glasses. We have had the tote for two years and it looks new! The only thing I have found is a six bottle unit-- load some slots/openings with wine bottles, the others with glasses. Hardly weighs anything, it's made of scuba-type material. very light. weighs just like thick cloth. Can it be personalized with an initial? BEST ANSWER: no, it's truly neoprene fabric, like a knee brace. However, I heartily recommend this bag. We never travel without it! The 3 bottle wine tote cannot be personalized. The Weekend Wine Bag, however, can be personalized as another option. Can this fit 1 liter swing top bottles? These are the bottles typically used for home brewing. Also does this item come in camo print? Thank you for your help. BEST ANSWER: Thank you for your inquiry. Unfortunately there is no way of knowing as we do not have those type of bottles in house to test. You could always puchase and return if they did not fit. If you have any further questions, feel free to to reach out to us at 800 356 8466. Thank you again. It holds three of the standard size 750ml bottles. You may be able to fit two 1 liters if you adjust the dividers. Are there dividers between the bottles? Is the cushioning adequate for protecting the wine when placed in checked luggage on a flight? BEST ANSWER: Thank you for your inquiry. While there are dividers, be sure to pack the neoprene tote very carefully as you should be okay. Your best best however is always our Travel Wine Safes. If you have any further questions, please feel free to call us at 800 356 8466. Thank you again. The bottles are protected by sleeves around each to prevent clinking together. The cushioning would be adequate for checked luggage. Does this product have a warrenty? BEST ANSWER: This item does not have a warranty. If it shows up damaged however please call in to our customer service department and they will be able to assist. would this product hold the larger champagne bottles if so how many would it hold? We had gotten a few years back a wonderful cooler from you that held 2 champagne bottles called a BYO Chiller it's # was 951-01-01 was wondering if that product still exists somewhere or what would be your closest product to it. hard sided, freezable ice pack container that also served as a divider, held 2 of the larger champagne bottles nicely. BEST ANSWER: As this Wine Tote is only 14" tall, and most standard Champagne bottles are 15" tall, I'd say that you may get one possible two bottles of the larger Champagnes like Dom or Krug in the tote. Do you need to do anything with the gel packs (ie. place in the refrigerator) or are they ready to use in the bag? BEST ANSWER: Thank you for your inquiry. Yes, the gel packs do need to get cold by placing them in the fridge or freezer before use. If you have any further questions, feel free to contact us at 800 356 8466. Thank you again. are the tops of the bottles exposed as in the pic or is there some type of cover? BEST ANSWER: It does have a cover! What size wine bottles will this hold? Will this wine carrier completely conceal the wine bottles? This bag is great. It has an exterior pocket for miscellaneous items, cork screw, etc and the cool packs work great for keeping your wine or other adult beverages cool for a short period of time. We have actually used it to transport wine which we keep in our wine refrigerator purchased here also and vodka which we keep in the freezer. Do not expect the cool packs to keep your items cold for an extended period of time. A would say a couple of hours tops. Other than that can't find a bad thing to say about this tote bag. Love this thing. I'm always taking wine to friends for dinner, or on our boat. This carrier both keeps wine cool for many hours, and protects bottles from breaking. I own 2 and have given it as gifts. People LOVE it. This is a "Man" bag!!! I bought 2 of these bags. I work for a winery and often have to take 2 to 3 bottles to pour for customers, this is the perfect bag. Very professional looking and masculine. The second one is for a gift for a wine enthusiast Birthday! What a great gift for the wine lover! If you store your wine in a cooler you can transport up to three bottles at a time and keep the chill with the gel packs that fit in the sides. This is a great gift to give and receive! While there is ample room in the tote bag for three bottles of wine and the ice packs work for a while, another pocket for wine glasses would improve it overall usage. There is a pocket on the front and that is ample for an opener and a foil cutter. This wine carry bag is practical, not overpriced and well made. Perfect for carrying wine. The freezable gel packs are a great idea for chilled wine. I finally found the perfect way to transport my 22oz craft beer selections. The bag keeps them safe, chilled, and even looks great. So much better than lugging around a cooler, especially to a dinner party or even a poker game. Durable, functional and a good value. I'm in the wine business so this bag is perfect when I'm showing just a few wines. Very durable and functional especially when used with the ice packs. To be fair, the ice packs it comes with are ok for keeping wine cool for about 2 hours. However, I have other ice packs I use with the bag and that extends the cooling time to about 4 hours. It holds 3 bottles and has comfortable handles and a shoulder strap. The side pocket is good to hold some file folders and best of all, doesn't get wet from the bottles sweating inside the bag. We used this tote on a cruise we took recently, and it was perfect. If you only carry two bottles, there is room for an opener, cutter, and stoppers. This bag fits the bill. It works great for bringing your own wine to a restaurant or a friend's house. You can fit two or three bottles plus the wine opener. Holds three bottles and can accomdate 2+Magnum. Freezer packs do great job of maintaining temperature. I hope the neoprene holds up long term. This is a great bag for carrying wines to dinner parties or for a day in the park. The best feature are the cold packs which stash in the sides of the bag in order to keep whites cool. For short or long distance travel. Solves the problem of trying to find a secure place in the car or RV to transport wine. Holds bottles securely and keeps them cold too. As always, easy-to-use website and prompt delivery. I bought this as a gift to my daughter who frequently takes high end wines to restaurants. It's the perfect size for dinner, one white, one red and one backup wine. a great gift for the travelor. Love the bag.Enough for 3 bottles,nice insulation,room for cork screw.The only problem I keep losing it and somehow never find it .I wonder why? We keep it in the freezer and use it to transport champagne all the time, does a great job maintaining drinking temp for half an hour or so (or a couple of hours for reds). Only drawback is, if you stuff a bunch of ice around the bottles for extra chilling, it will melt and leak. So, that's a design flaw. Perfect for an evening at the concert, two bottles of wine and two glasses in the middle sleeve, we LOVE it. I gave this bag as a gift. They used it 3 days after receiving and it carried the three bottles and kept the white cold. =) Affordable and functional. Great bag to use as a gift bag for sharing wine!! We have several of the 2 and 3 bottle bags! Nothing fancy and very practical. It's not bulky, fits three bottles great and the interior ice pack pockets keep the wine cool. Perfect for taking wine to dinner!!! use for traveling and taking wine to dinner. Love this product, easy to carry, bottles are protected and stay cold. We chilled 3 bottles of wine in the fridge and slipped them in the tote bag. We put the bag in the trunk of our BMW motorcycle and the wine stayed cold even without the 2 gel packs after riding for 5 hours in 70 degree weather. My husband can't stop saying how much he likes this wine tote! This wine tote is the best we have found! The neoprene provides good protection and also insulates better than others we have owned. This is a great gift. I have purchased several for birthday and anniversary occasions and usually accompany it with a good bottle of wine. It is also perfect for trasnsporting wines to parties and picnics. I love these Neoprene bags, any size! I like this wine bag to take with me to dinner and have all my favorite wines with me. Very nice sturdy wine bag! Used for travel, sturdy and kept my wine safe and cool. The size is great. A take along for wine tasting in the Temecula Valley. There is enough room for tall bottles, the six bottle carrier is to short. Purchased this bag for a birthday gift and will probally buy one for myself. I like it a lot. Fits 3 btls well, even if you have oversized btls like Champagne and Burgs. The quality is excellent. It's not heavy to carry but it feels heavier empty than I expected. Don't know where the weight comes from? Something in the material or something sewn for structure in I'd guess? I'm very happy with it though and doesn't seem heavy once you have btls in it and are on the go. I like that the top closes. The zipper is effecient and works well. Probably prefer some other method of closure but it works just fine and helps keep the wine cool. Would like the front side pouch to close too so don't loose the cork screw but it has a pretty deep pocket. To transport wine from one place to another to keep it cold. It is a compact functional wine carrier. This bag is solid and nice to look at. Packed 3 bottles in it last weekend for a trip out of town and over two hours later the wine was still chilled and perfect. This bag not only keeps the bottles cool, but the bag is padded and provides protection against breakage. Highly recommend. This wine carrying case is a perfect convenience item for us! It's functional and really well made. The cooling capability is especially well thought out and effective. Perfect for taking wine to friends places. We needed a carrier to transport our Walla Walla wine when we travel by car. An evening drink after we arrive at our destination greatly enhances our evening activities. This is just the thing, convenient, easy to carry, with plenty of room for several types of wine. Great bag. Carries a lot. Gel inserts kept 2 bottle of Sauvignon Blanc cold for outdoor 4th of July fireworks show in Las Vegas! 3 Bottles - Just the Best! 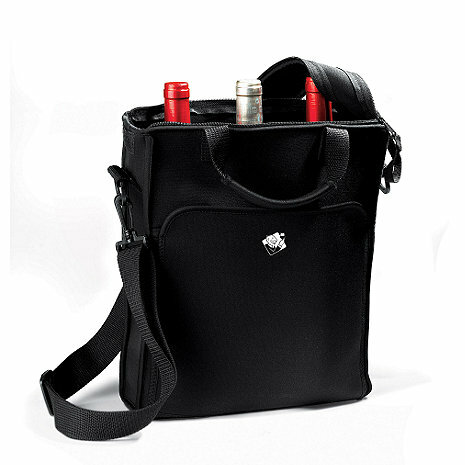 I love the Wine Enthusiast wine carriers and get so many compliments on them! Plus - it's very hard to find a practical 3 bottle wine carrier and this ideal for white, red or a combination of both! FYI - I'm a big fan of white wine and these accomodate all the ice packs I can come up with, yet remain attractive/unobtrusive. And it works perfectly with any combination of white/red! I now have three bags. They are just the best!!! As a small vineyard owner and wine producer, I use the wine tote when I'm offering samples to wine retailers and restaurants. Very comfortable! Used to transport wine to social events. Great bag all the way around. Will be buying this bag for friends and family since they all want one for themselves after checking mine out. Great price, great bag. Very happy with it. GREAT FOR COUPLES OR THREESOMES FOR THE PARK OR RECREATION. PLENTY OF ROOM FOR OTHER ITEMS AND CONSUMABLE GOODS. enjoy the company of friends or family prior to or after dinner. I really like this product. It was a gift for my husband when he doesn't care to take the leather wine bag. Nice, sturdy, and an impressive addition to my wine accessories. Love taking it with me and showing it to my friends.